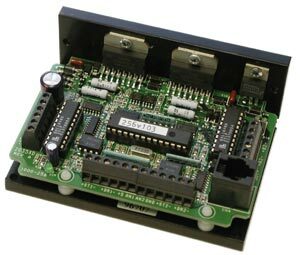 The 2035XD step motor driver is a two axis, software configured step/direction or oscillator drive. Drives can be quickly and precisely configured using our eXposition™ software and a Windows PC. In oscillator mode, the two drives generate their own acceleration and deceleration profiles and are commanded by digital run/stop signals. These signals can be supplied by PLCs, mechanical switches, single board computers or other motion control devices. Speeds may be fixed or can be set “on the fly” by 0 to 5 volt analog signals.